Jose Reyes, James Shields and Chase Utley lead a list of expensive veterans who could be on the move before the Aug. 31 waiver trade deadline. The trade deadline is dead—long live the trade deadline! But just because that deadline came and went on July 31 doesn’t mean that teams can no longer made deals. Instead, teams must now clear the additional hurdle of passing a player through waivers before making a deal. Over the rest of August, most players will be placed on revocable waivers, giving teams—in the reverse order of the standings starting in the league of the player’s current team—a chance to claim them. Players who are claimed can be called back by their original teams, rendering them ineligible to be traded; traded to the claiming team; or simply released to the claiming team, saddling them with a bad contract. Players that go unclaimed by the other 29 teams are eligible to be traded anywhere. A new deadline applies to those deals, however: In order to qualify for a team’s postseason roster, a player must be acquired by Aug. 31. Because they must clear waivers to be traded, the players most dealt in August are typically old, expensive or simply not very good. Last year, there were 15 trades in August, but the most notable players dealt were Adam Dunn, Josh Willingham (both since retired), Jonathan Broxton, Alejandro De Aza, Gordon Beckham, Roberto Hernandez, Kevin Correia, and Kelly Johnson. That doesn’t mean that a waiver-trade can’t have a big impact. Most famously, the massive salary dump that saw the Red Sox trade Adrian Gonzalez, Carl Crawford, Josh Beckett and Nick Punto to the Dodgers for five players and more than $270 million in salary relief came in late August of 2012. Prior to that, the Cardinals’ acquisitions of Woody Williams in '01 and Larry Walker in '04 were crucial to their wild-card and pennant wins, respectively, in those seasons and stand as two of the best waiver-period additions of the last two decades. With all of that in mind, here’s a look at ten potential waiver-trade candidates, listed in alphabetical order. All stats are as of Monday, Aug. 3. The trade that sent Byrd to the Pirates in 2013 came on Aug. 27 and had a big impact on the Pirates' return to the postseason that year, with Byrd hitting .318/.357/.486 down the stretch and .364/.391/.591 in the playoffs, including a 2-for-4 performance with a home run in Pittsburgh’s 6–2 win over Cincinnati in the Wild-Card Game. Two years later, Byrd is still hitting—.250/.303/.480 with 18 home runs on the season despite missing two weeks with a fractured wrist in early June—but will turn 38 at the end of the month and has a $8 million option for '16 that will vest if he reaches 550 plate appearances on the season (which he still could do). I would not be shocked to see Byrd slip through waivers and return to Pittsburgh if the newly acquired Michael Morse continues his season-long struggles, as Byrd would be a good fit in a job share with Gregory Polanco in rightfield, an arrangement which would also keep his option from vesting. Crisp’s age-35 season has consisted of him going 2-for-45 in May and spending the rest of the year on the disabled list with a cervical strain in his neck. However, he’s due to be activated from the disabled list on Monday, and if he can show any of his old form in his first couple of weeks back, the veteran switch-hitter could be an interesting centerfield option for a contender in need of depth at the position, such as the Cubs, Giants, Twins or Mets. To make a deal happen, however, the A’s would likely have to eat a good portion of his $11 million salary for next year. With Troy Tulowitzki gone, Gonzalez’s days with the Rockies would seem to be numbered. With $37 million left on his contract for the next two seasons, he should be able to slip through waivers, and given his .418/.472/.924 line with 11 homers in his last 21 games, the Rockies may never be able to sell any higher. However, according to ESPN’s Jerry Crasnick, Gonzalez’s recent performance may have driven the Rockies’ price too high, which is why he was not dealt prior to the July 31 deadline. Perhaps Colorado will find a way to temper its expectations this month and make Gonzalez available to a contender for the stretch run. Given his decline at the plate in recent seasons, you would think the Reds would be unable to find a taker for the final two years and $27 million left on Phillips’s contract (which doesn’t include the remainder of his salary for this season). But with Johnny Cueto and Mike Leake traded, Cincinnati may be more amenable to eating some portion of that contract. That and the slight uptick in Phillips’s performance this season (his batting line is marginally better than last year’s, his fielding is still strong and his ability to steal bases appears to have returned, combining to make him a two-win player already this season) could make him a compelling option for a contender in need of a second baseman, such as the Yankees or Angels. The Red Sox' desire to unload Sandoval’s contract ($75 million over the next four years) was a hot topic leading up to last week's deadline. Their only chance of doing that is to include him in a larger deal along with a far more desirable player, but given their 2012 blockbuster with the Dodgers and the White Sox’ claim of Alex Rios in '09, we’ve learned never to say never. 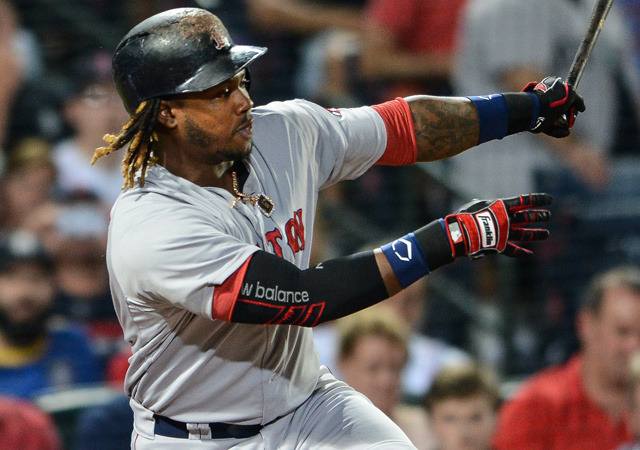 Boston would seem to have a better chance of unloading Ramirez, who is owed $66 million over the next three years with a $22 million option that can vest with 1,050 plate appearances over the 2017 and ’18 seasons and a clean bill of health after the latter. Ramirez has been a disaster in leftfield for Boston and is blocked in the infield by Xander Bogaerts, Dustin Pedroia and Sandoval, but he’s still an elite hitter whose value could soar on a contender who can slot him at DH or back in the infield, where he’s more comfortable and more competent. Boston may even be willing to eat some money to make that happen, as Ramirez, who is still just 31, has been a replacement-level player in left despite hitting 19 home runs. If the Rockies are indeed rebuilding, they don’t have much need for an injury-prone, 32-year-old shortstop who is clearly past his prime. Reyes’s inclusion in the Tulowitzki deal seemed primarily designed to balance the money (Reyes is owed $48 million over the next two years) and give the Rockies a big-name player they could present to their fans in what amounted to a salary dump. With the sting of the loss of the franchise player now a week old, however, Colorado seems likely to try to find a taker for Reyes who could provide them with additional salary relief. One fascinating proposition would be a straight-up trade for the Orioles' J.J. Hardy, who has hit just .237/.267/.344 this season. Hardy, who turns 33 on Aug. 19, is ten months older than Reyes and also under contract for two more years, but has just $28.5 million left on his deal after this season. A straight-up trade with no money changing hands would save Colorado $19.5 million and could provide a boost to Baltimore's lineup as the O's battle for the AL wild card. Buried in what is arguably baseball’s best division, the Brewers don’t have much need for their veteran closer, who is owed $9.5 million beyond this year with a $6 million club option for 2017. Rodriguez, however, has been outstanding in his return to the ninth inning over the past two years and has been downright dominant this season, posting a 1.46 ERA in 37 appearances and striking out 10.2 men per nine innings with a career-best 4.67 strikeout-to-walk ratio. The Astros, eyeing the sort of late-game dominance that helped the upstart Royals win the pennant last year, were reportedly aggressively seeking a high-end closer at the deadline, talking to the Padres about Craig Kimbrel and the Reds about Aroldis Chapman. Rodriguez, who was baptized in the fires of the postseason as a rookie in '02, would fit that bill nicely. Despite a lot of talk, both on the part of the media and between A.J. Preller and fellow general managers, the Padres made just one low-level trade prior to July’s deadline, acquiring veteran lefty reliever Marc Rzepczynski from Cleveland. Despite talk of Preller believing his team—which went on an ill-timed 10–4 run leading up to the deadline—still has a shot at the postseason (it doesn’t), the Rzepczynski deal wasn’t necessarily aimed at this season; he’s under team control for next year, as well. So it wouldn’t be a radical change of course for the Padres to unload what they’ve quickly decided was a bad contract for Shields, who has been surprisingly homer-prone and shy of league average in his age-33 season and is still owed $65 million for the next three years. Shields does not have a no-trade clause, but he does have an opt-out after 2016, which could be enticing for teams aware of how particular Shields was about where he signed as a free agent last winter. A rebound season in '16 could be enough to convince Shields to opt out, even with $44 million left on his deal. Utley is old (36), broken (on the disabled list with inflammation in his right ankle) and has been terrible this season (.179/.257/.275 in 249 PA and subpar in the field). However, he’s a borderline Hall of Famer who is simply too talented have completely lost it all at once. Utley began a rehab assignment on Sunday, going 2-for-3 with a walk in his first game, and believes he found a mechanical flaw in his swing that was related to the discomfort in his ankle, which dates back to spring training and may have played a role in his poor showing in the field as well. With his disabled list stay having reduced the likelihood of his reaching 500 plate appearances to vest his $15 million option for 2016, Utley could become a compelling option for teams like the Yankees and Angels if he makes a strong return.